The CDC publishes an annual report on Health in the United States and included in the report is a “Chartbook”. It’s 574 pages long, but you can skip to page 32 for the start of the charts. There are some quite horrendous charts, especially the pie charts, that you will get a kick out of. You can download the data on CDC Wonder. Once you create your query, you get a spreadsheet of the results, a map, and a bar chart. The bar chart is particularly poor and only allows you to pick two dimensions. I have downloaded the data and produced an interactive dashboard via Tableau Public. Within this dashboard you can filter by Gender, Age, State and Disease. In the end, I have included all of the views from CDC Wonder, plus much more. The infection rate for the total US has continued to climb for all diseases combined. This is largely due to Chlamydia. Syphilis infection rates declined from 1996-2001, but have continued to climb since. Particularly concerning is the rate in Washington, DC. In fact, Washington, DC has the highest infection rate for all three diseases. Alaska’s overall infection rate in twice the national average, with the Chlamydia rate 86% higher than the national average. This is definitely worth looking into. The overall infection rate for females is more than double that for males. Females between the ages of 15-24 are most likely to get infection, while males are most likely between the ages of 20-24. There are many more observations and insights to be gleaned from this dashboard. It is considerably quicker to identify outliers and trends with a simple dashboard like this than with CDC Wonder. 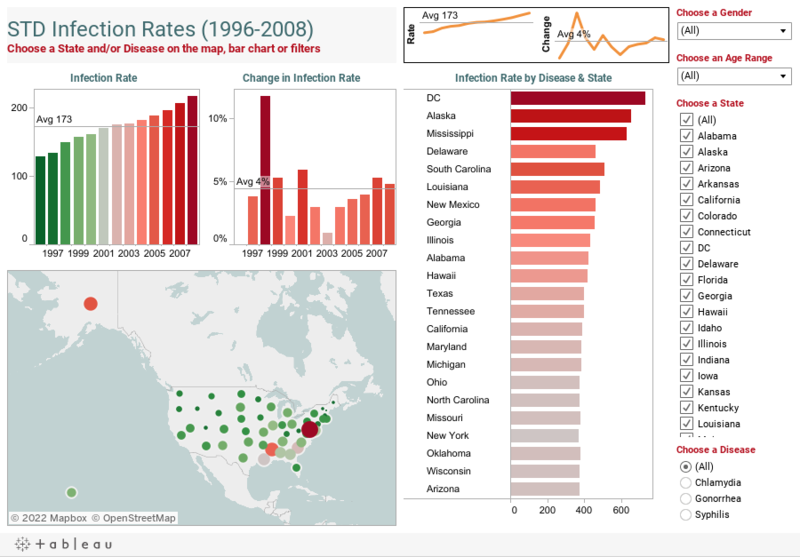 Imagine how much more useful the “Chartbook” would be if the CDC used Tableau. What other observations can you make? Correct me if I am wrong, but I do not think it makes sense to compare DC to states, From my understanding, DC is more of a MSA than a State, hence it will be an outlier. nice viz, Andy - it's a well designed dashboard. And I love that About box! Joe, I included DC since it's included in the CDC report. Plus, since the measure is an infection rate (STDs/100,000 people) the data is relative to all of the "states".